Anadigics' financial position improved in Q4: revenue was up 11% to $20.9 million, and net cash grew $4.9 million to $14.4 million. The infrastructure segment, focus of their new strategy, generated 47% of sales, below Q3's 53%. Analog Devices reported Q1 revenue of $772 million, 23% above the year-ago period and down 5% sequentially. The communications segment generated $204 million, 45% above Q1 of 2014 and down 5% sequentially. The year-over-year jumps reflect the acquisition of Hittite. Fabrisonic has an interesting 3D printing process for making waveguides and antennas. Freescale announced a 1250 W CW LDMOS power transistor, claiming the highest RF power from a plastic package. The device covers 1.8 to 600 MHz. Freescale and Bell Labs are expanding their collaboration, targeting wireless and wireline convergence and 5G. 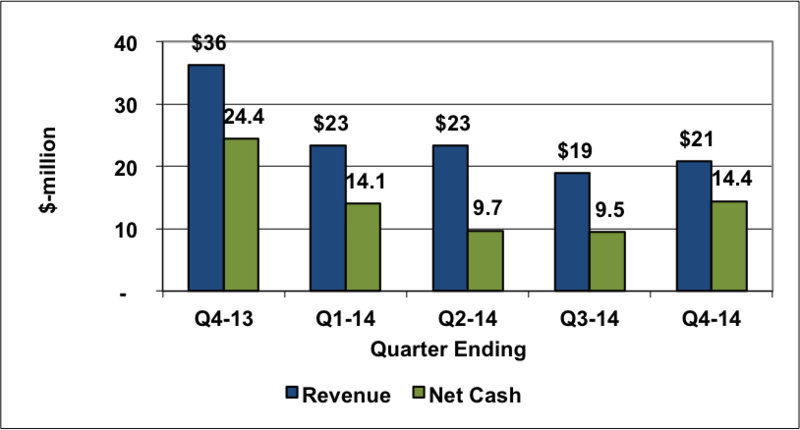 Keysight Technologies reported Q1 fiscal 2015 revenue of $701 million, 4% above Q1 of 2014. GAAP net income was $70 million, $0.41 per share. This is their first quarter as an independent company, after separating from Agilent. MACOM released a 100 W CW SP2T reflective PIN switch that covers 30 MHz to 3 GHz. At 2 GHz the switch has 0.35 dB insertion loss and 51 dB isolation. NXP announced three new LDMOS power transistors: a 200 W device for the 2.5 to 2.7 GHz cellular bands. Biased at 28 V, it delivers 65 W average output power with 30% drain efficiency and 17 dB gain. The second device is a 170 W asymmetric Doherty PA for the 2.3 to 2.4 GHz cellular bands. It provides 28 W average output power with 48% drain efficiency and 15.5 dB gain. The third PA is designed for pulsed applications from 500 to 1400 MHz; it delivers 25 W output with 19 to 21 dB gain and 50 to 58% drain efficiency. Dean Priddy is retiring from Qorvo at the end of March. This is not surprising, and we can expect more changes as RFMD and TriQuint morph into Qorvo. Priddy served as CFO for RFMD prior to the merger. Will Wi-Fi calling disrupt cellphone service? Two start-ups are aiming for that. Ashton Carter became the latest U.S. Secretary of Defense on February 17, inheriting a long list of regional conflicts and a defense strategy in transition. Would you want that responsibility? Raytheon's Small Diameter Bomb II completed live fire tests and is now ready for LRIP. The tri-mode seeker includes a millimeter wave radar. Have you played with the Raspberry Pi computer? If so, leave a comment telling us about your applications. Pretty impressive performance for the low price. Read The Wall Street Journal review. This is Engineers Week. Does your company have a program to encourage youth to explore engineering as a career? Raytheon does. However John Mruz Sr. questions whether engineering is a career that we ought to be promoting. What do you think? Other companies or markets that you'd like me to follow? Leave a comment, and I'll add them to my list.